Opal (Bishop) Adams, 88, of Crab Orchard, passed away Sunday, January 20th, at the Rockcastle County Hospital in Mount Vernon. Opal was born in Brodhead, Kentucky on February 12, 1930 to the late William and Amy (Weaver) Bishop. 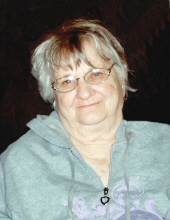 She loved playing bingo, working crossword puzzles, reading, dancing and most of all spending time with her family. Visitation will be after 5:00 PM on Wednesday, January 23, 2019 at McKnight Funeral Home. To send flowers or a remembrance gift to the family of Opal Bishop Adams, please visit our Tribute Store. "Email Address" would like to share the life celebration of Opal Bishop Adams. Click on the "link" to go to share a favorite memory or leave a condolence message for the family.